cF.M. Kirby Research Center for Functional Brain Imaging (S.J. ), The Kennedy-Krieger Institute, Baltimore, Maryland. BACKGROUND AND PURPOSE: The optimal paradigm choice for language mapping in clinical fMRI studies is challenging due to the variability in activation among different paradigms, the contribution to activation of cognitive processes other than language, and the difficulties in monitoring patient performance. In this study, we compared language localization and lateralization between 2 commonly used clinical language paradigms and 3 newly designed dual-choice semantic paradigms to define a streamlined and adequate language-mapping protocol. MATERIALS AND METHODS: Twelve healthy volunteers performed 5 language paradigms: Silent Word Generation, Sentence Completion, Visual Antonym Pair, Auditory Antonym Pair, and Noun-Verb Association. 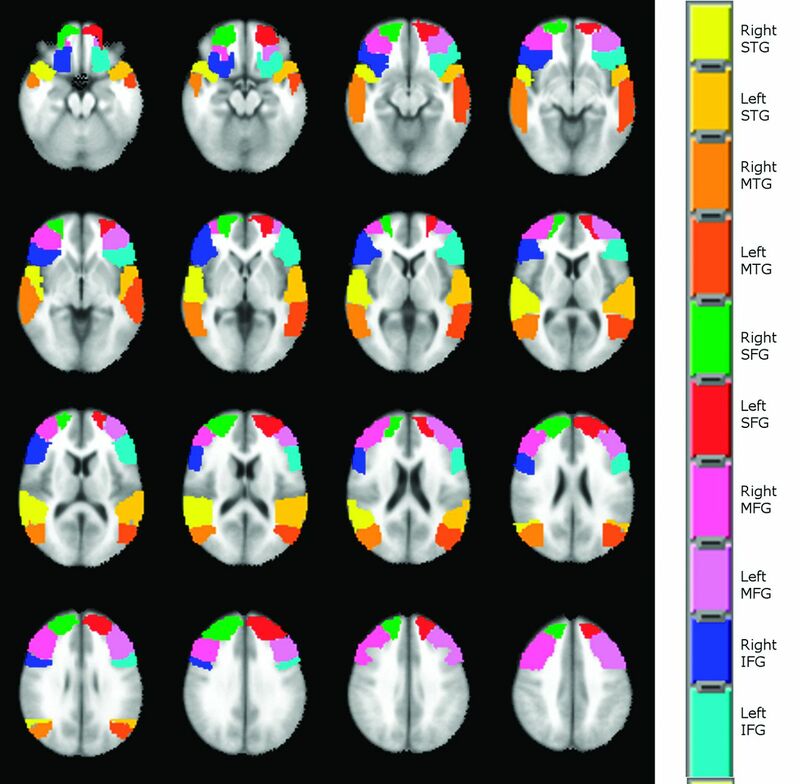 Group analysis was performed to assess statistically significant differences in fMRI percentage signal change and lateralization index among these paradigms in 5 ROIs: inferior frontal gyrus, superior frontal gyrus, middle frontal gyrus for expressive language activation, middle temporal gyrus, and superior temporal gyrus for receptive language activation. RESULTS: In the expressive ROIs, Silent Word Generation was the most robust and best lateralizing paradigm (greater percentage signal change and lateralization index than semantic paradigms at P < .01 and P < .05 levels, respectively). In the receptive region of interest, Sentence Completion and Noun-Verb Association were the most robust activators (greater percentage signal change than other paradigms, P < .01). All except Auditory Antonym Pair were good lateralizing tasks (the lateralization index was significantly lower than other paradigms, P < .05). CONCLUSIONS: The combination of Silent Word Generation and ≥1 visual semantic paradigm, such as Sentence Completion and Noun-Verb Association, is adequate to determine language localization and lateralization; Noun-Verb Association has the additional advantage of objective monitoring of patient performance. Other limitations of clinical language blood oxygen level–dependent (BOLD) fMRI include both variability in activation patterns among different language paradigms and the variable specificity of activation for the delineation of the essential language cortex. Cognitive processes such as decision-making, attention, and working memory are also involved in language processing, thereby making it more difficult to explicitly use language mapping to distinguish essential and nonessential regions of the language network. For all of the above-mentioned reasons, fMRI for language mapping is still not universally accepted as a standard of care for presurgical planning. In light of the recently developed language models and to contribute to the effort to establish effective protocols for language fMRI, we designed this study to determine which paradigm or combination of paradigms provides an adequate and streamlined protocol for comprehensive language mapping in clinical fMRI studies. This was carried out by comparing patterns of activation between 2 commonly used clinical language fMRI paradigms and 3 newly designed semantic language tasks that allow objective monitoring of patient task performance. Examples of the stimuli in the control (first and third columns) and active (second and fourth columns) tasks in the 4 visually delivered paradigms used in the study: A, Silent Word Generation; B, Sentence Completion; C, Visual Antonym Pair; D, Noun-Verb Association. Visual fixation on 2 consecutive nonsense drawings, each for 10 seconds. Covert generation of words for 2 consecutively presented letters, each for 10 seconds. Scan through 5 consecutive samples of scrambled letters arranged to resemble words in a sentence. Covert reading of 5 consecutive real sentences with the last word missing and covert generation of a word to complete each sentence. Visual fixation of 5 consecutive drawings with a cross placed in 1 of the 4 corners of the screen. Keypad button press was required if the cross location was in the upper or lower right corner. Reading of 5 consecutive pairs of words. Keypad button press was required if the 2 words were antonyms. Listening to 5 consecutive pairs of tones. Keypad button press was required if the 2 tones were identical. Listening to 5 consecutive pairs of words. Keypad button press was required if the 2 words were antonyms. Visual presentation of 5 samples of a noun on the top row and a pair of verbs on the bottom row. Keypad button press was required if the verb presented on the right of the bottom row was more closely semantically associated with the presented noun than the verb on the bottom left (eg, Fig 1D; the verb “park ” on the bottom left was more closely associated with the noun “car ” than the verb “pull ” located on the bottom right; therefore, a button response was not required in this case; vice versa, if the verb “park ” was on the bottom right and the verb “pull,” on the bottom left, a button response would have been required). For the dual-choice tasks, the number of expected button presses in the control and active blocks was balanced. A training and practice session was performed outside the MR imaging scanner with each participant to provide task instructions and opportunity to practice the tasks by using similar but different stimuli from those that were included in the actual examination. Images were acquired by using a 3T Magnetom Trio scanner (Siemens, Erlangen, Germany) equipped with a 12-channel head matrix coil. BOLD images were acquired by using a single-shot T2*WI gradient-echo EPI sequence. Imaging parameters were the following: TR = 2000 ms; TE = 30 ms; flip angle = 90°; FOV = 24 cm; 80 × 80 matrix acquisition; section thickness = 3 mm with a 1-mm gap between sections. Structural images for coregistration and overlay of functional activation maps were acquired by using a standard 3D T1WI gradient-echo sequence (TR = 2300 ms; TI = 900 ms; TE = 3.5 ms; flip angle = 9°; FOV = 256 cm2; 256 × 256 matrix acquisition; section thickness = 1 mm). where PP indicates peak to peak; PP (ideal TS), maximum (ideal TS) to minimum (ideal TS); and Baseline = b0 + b1 × (average polynomial grade 1) + a × minimum (ideal TS), where b0 is the baseline constant, b1 a linear trend slope, and a the regression coefficient. Language localization and lateralization were compared among the 5 paradigms in 5 ROIs (IFG, superior frontal gyrus [SFG], middle frontal gyrus [MFG], middle temporal gyrus [MTG] and STG) automatically defined for the left and right hemispheres on the MNI atlas available in AFNI (Fig 2). To assess statistically significant differences in language localization, we performed a nonparametric analysis with statistical significance considered at the P < .01 level. A Friedman test was run voxelwise in each region of interest followed by Wilcoxon signed rank tests between each pair of paradigms in the voxels where the Friedman test score achieved statistical significance. Multiple comparison correction was applied on the results of the Wilcoxon tests by using a combination of probability and clustering thresholding obtained by using the AlphaSim simulation program available in AFNI. Regions of interest defined on the MNI-152 atlas, where language localization (PSC) and lateralization (LI) were compared among the 5 language paradigms adopted in this study. where LH and RH are the weighted sum of all voxel t values in the left and right hemisphere portion, respectively, of each region of interest. The same nonparametric tests used for language localization analysis were performed to assess differences in LI among the paradigms in the 5 ROIs. Statistical significance was considered at the P < .05 level. All 5 ROIs showed voxels with χ scores above the threshold associated with statistical significance (P < .01). Table 1 summarizes the significant results of the Wilcoxon tests comparing the PSC between pairs of paradigms in each region of interest. The results of the simulation run in AlphaSim determined a cluster size of 9 voxels to apply multiple comparison correction on the Wilcoxon test χ score maps at the P < .01 level. The verbal fluency paradigm Silent Word Generation and Sentence Completion were demonstrated to be more robust activators than the semantic paradigms in frontal gyri ROIs (IFG, MFG, SFG) in the dominant left hemisphere, with Auditory Antonym Pair showing the weakest activation in the left IFG, MFG, and SFG but stronger than Visual Antonym Pair and Noun-Verb Association in the right IFG, MFG, and SFG. Silent Word Generation provided the weakest activation in both the right and left MTG and STG. Sentence Completion was more robust than Auditory Antonym Pair and Visual Antonym Pair in the left MTG and STG, but not more robust than Noun-Verb Association. Auditory Antonym Pair and Sentence Completion were the strongest activators of the right MTG and STG. In Table 2, the results of the Wilcoxon tests demonstrating a significant difference at P < .05 in LI between each pair of paradigms in each region of interest are reported. Silent Word Generation was the best lateralizing task in the expressive ROIs, whereas Sentence Completion did not outperform, in general, Noun-Verb Association and Visual Antonym Pair as a lateralizing task, except for Noun-Verb Association in the SFG. Auditory Antonym Pair provided the most bilateral activation both in the frontal regions and in the MTG. The other 4 paradigms did not demonstrate statistically significant differences in LI in the MTG. No significant differences in LI between the paradigms were found in the STG. In this study, we compared the localization (as locally detectable statistically significant PSC) and lateralization (via the LI) provided by 2 clinically used covert language tasks, Silent Word Generation and Sentence Completion, with those provided by 3 newly designed dual-choice block-design semantic language paradigms, Visual Antonym Pair, Auditory Antonym Pair, and Noun-Verb Association in a group of right-handed healthy volunteers. We made this comparison to determine which paradigm or set of paradigms would be most useful for presurgical mapping of the eloquent language cortex. The analyzed ROIs included more than just the classic Broca and Wernicke areas (left IFG and left STG, respectively), because it is well-recognized that language activation extends well beyond these 2 areas.2 Language is not a unitary process but rather a collection of processes operating at distinct levels, such as phonetics, phonology, orthography, and semantics. Therefore, the representation areas related to these processes deserve attention in presurgical planning because their inadvertent resection may also cause postoperative language deficits. We adopted a nonparametric statistical approach because the variables that we compared among the different tasks in the different ROIs for localization (PSC) and lateralization (LI) are defined as ratios of Gaussian variables, and in general, the distribution of a quotient of 2 normal variables can be multimodal. The requirement of working memory and articulary recording activity both in the control and active tasks for Auditory Antonym Pair justifies the same findings in the MFG and SFG.15,16 The analysis of patterns of activation in the temporal gyri demonstrated a weaker BOLD PSC for the purely verbal fluency task Silent Word Generation both in the left and right hemispheres compared with the other 4 paradigms, all of which are associated with semantic processing localized in the middle temporal and angular gyri.17 The relative strength of activation among Sentence Completion, Noun-Verb Association, Visual Antonym Pair, and Auditory Antonym Pair was somewhat variable depending also on the considered hemisphere. In particular, as reported in Table 1, Auditory Antonym Pair was the most robust activator task in the right MTG and STG because its PSC in these 2 regions of interest was greater than Silent Word Generation, Noun-Verb Association, and Visual Antonym Pair in both regions. Auditory Antonym Pair activation results are also highly bilateral in the STG (average LI = 0.20 ± 0.20) and in the MTG (average LI = 0.15 ± 0.20), where it was also significantly lower in comparison with the other 4 paradigms (P < .05). One limitation of this study includes the exclusion of the cerebellum from region-of-interest analysis. The cerebellum has demonstrated fMRI activation during silent articulation.22 Cases of cognitive deficits in association with cerebellar damage have been reported,23 yet frank aphasic disturbances are rare. Multiple cognitive studies performed on a group of healthy volunteers have demonstrated a further parceling out of language functions in each of the 5 ROIs considered in our work.24,25 However, since this study aimed to improve language presurgical mapping, where analysis is conducted at the single subject level, such parcellation would not be practical and it most likely would not add any critical information for patient surgical management. Finally, no Wada testing was performed to actually confirm language lateralization in these subjects, but this would not be ethical in a group of healthy volunteers. In this study, we demonstrated that the combination of a fluency task such as Silent Word Generation and ≥1 visually delivered semantic task provides an adequate protocol for determination of language localization and lateralization. The newly designed Noun-Verb Association paradigm is potentially very effective because its forced dual-choice paradigm design allows effective patient monitoring of task performance. Nevertheless, it is always advisable in clinical studies to have a variety of available paradigms because if a patient finds a particular task too challenging because of neurologic impairment, it will rarely produce meaningful fMRI results. The authors thank Gayane Yenokyan, MD, PhD, for assistance with data analysis. Disclosures: Domenico Zacà—RELATED: Grant: Siemens Medical Solutions,* Comments: Siemens provided support for my postdoctoral fellowship salary at Johns Hopkins University. Jay J. Pillai—RELATED: Grant: Siemens Medical Solutions,* Comments: This research grant paid for Dr Zacà's (my former postdoctoral fellow) salary. However, Siemens was not involved in the study design, analysis, reporting of results, or writing of the manuscript in any way, OTHER RELATIONSHIPS: I am an unpaid member of the Medical Advisory Board of Prism Clinical Imaging. *Money paid to the institution. This work was supported in part by a research grant from Siemens Medical Solutions (Dr Pillai is the Principal Investigator). Siemens was not involved in the study design, data collection, analysis, or manuscript preparation but did provide salary support for Dr Zacà. Paper previously presented in part at: 50th Annual Meeting of the American Society of Neuroradiology, April 21–26, 2012; New York, New York. Accepted after revision January 26, 2013.